is the temperature of liquid going down to the ground. 32ºC? I have never previously seen one higher than the mid 20s. 11th March 2012: Today is exceptionally sunny and clear, with a very high PV score, not quite as good as 5th Match, but still very high. 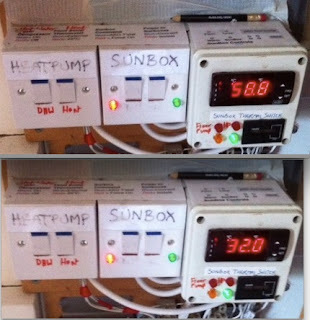 For me, with the new valve actuator fitted, I was glad to see that the sun box powered its way past the 20kWh mark and it is still mid afternoon. I expect it to continue storing heat-energy late into the evening. This is the first major test in 2012 of the new insulated design. I had some excellent days last autumn at the end of September, and we are having them now. Perhaps this demonstrates that the work on the new design was worth doing. Our annual solar capture is now consistently around at 3,000-3,080 kWh, whereas with the earlier design, it hovered around at the 2,950-3,000 mark. Also, the air temperatures were cold this morning, but with the insulated construction, the sunbox got going even before I was out of bed, with help from the morning sun.